188 pages | 13 B/W Illus. "Comprehensive, thorough and, most importantly, accessible to a wider audience of readers, this book offers a much-needed updated overview of cutting-edge research on language, gender and sexuality. It should be compulsory reading for all undergraduate students in the social sciences and humanities." 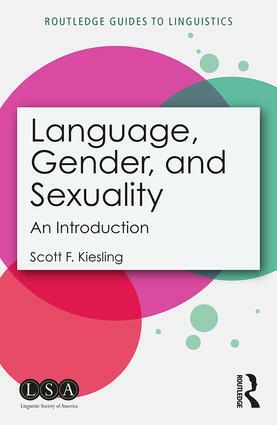 "Language, Gender, and Sexuality offers an accessible and engaging overview of the ways individuals relate to, describe and reconfigure gender and sexuality through language. Assuming no prior knowledge in this area, Kiesling walks the reader through over 40 years of research on the topic, highlighting both persistent themes and emerging trends. Kiesling’s book is an excellent resource for those interested in gaining a new perspective on the social dimensions of gender and sexuality." Scott F. Kiesling is Professor of Linguistics at the University of Pittsburgh, Pennsylvania, USA.